Small footprint takes up less countertop space than other frames or sign holders. 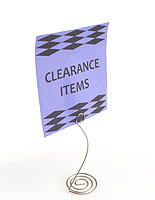 Strong alligator clip holds signs or pictures securely in place. Sold in a set of 3 different colors; red, black and hunter green. 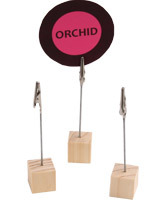 This card clip, also known as a sign holder, is perfect for displaying notes, memos, table numbers and photos. 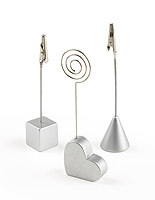 Featuring a small footprint, you can easily place this memo holder on any table or countertop. 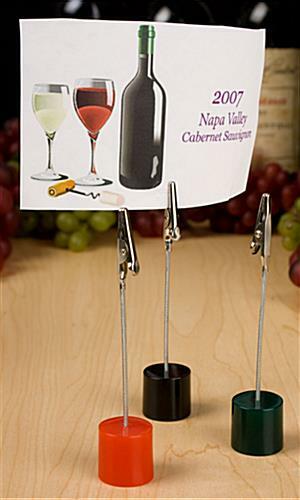 This picture holder, card clip can be used for any type of function, party or retail location. Restaurants typically place this sign clamp on a bar to advertise drink specials. This card clip can be used as a personal reminder, to keep important notes right at your fingertips. Use this memo holder in lieu of costly post-it notes. 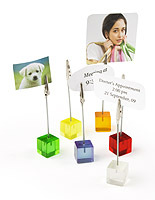 This card clip can also be used as a keepsake at a special event, such as a wedding or birthday. 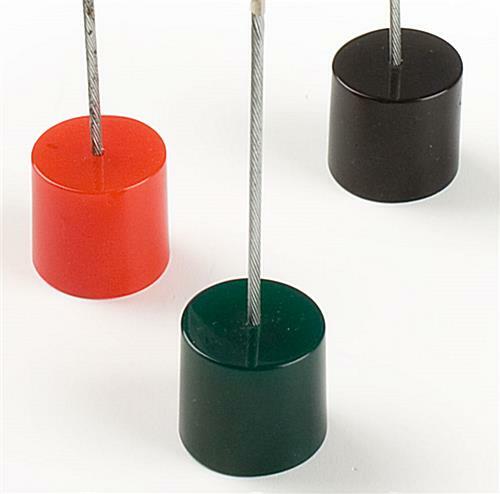 The colored plastic bases complement and blend with most any theme or décor. 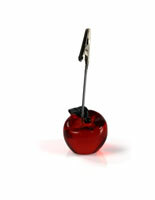 This card clip adds a splash of color onto a tabletop or counter. 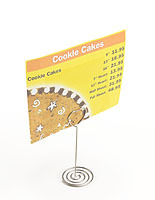 Place this sign holder next to a merchandise display to post additional product information. This picture holder, card clip consists of a plastic base with one strong alligator clip attached to a durable wire-rope cable. Signage and papers will be sturdily held in place by the clamp. 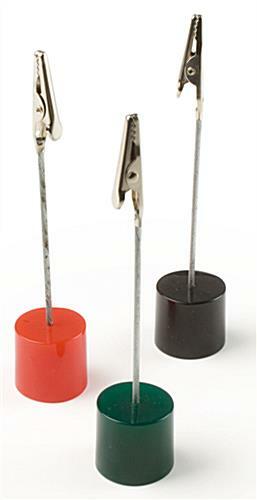 This card clip comes in a pack of 3 different colored bases: red, black and dark green. The cylinder base takes up very little space on a table or desk. This card clip, like a picture display and a memo holder, can be used in retail stores, restaurants, homes, offices and for other advertising purposes. When ordering please keep in mind that the item pricing is for a set of sixty holders. 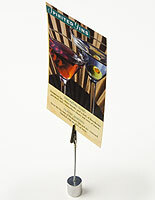 This card clip is an economical table number holder that can be used for a wide range of other functions. Please Note: When ordering, 1 unit = 60 card clips (20 of each color). The place card holders was a hit at my daughter College Graduation Party December 19, 2018.